Democratic presidential candidate Hillary Clinton is looking to be the first female Democratic nominee, and potentially the first female president of the United States. If she does, will life be different for us ordinary women raising children, working, looking for jobs, needing to share our, or to get our part of the national pie? Now joining us to give us her analysis is Liza Featherstone. 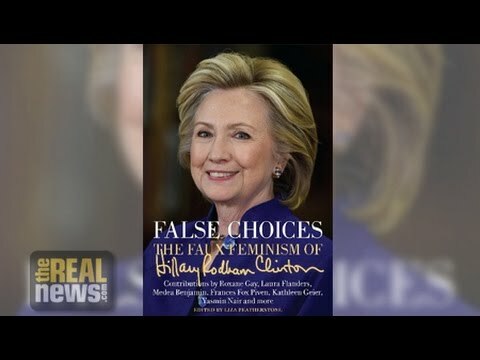 She’s a contributing editor to the Nation, and editor of the forthcoming book titled False Choices: The Faux Feminism of Hillary Clinton. Thank you for joining us, Liza. LIZA FEATHERSTONE: Thank you so much, it’s good to be with you. PERIES: Liza, you just wrote an article for the Nation: Why This Socialist Feminist Is Not Voting for Hillary. And you said that socialist feminism assumes that redistribution is the best way to improve life for women. Clinton has demonstrated contempt for turning this project into policy. Explain to us what you meant by that. FEATHERSTONE: It’s impossible to separate the goal of women’s liberation and women’s equality from our material circumstances. So what I meant by that was that, that in order for women to advance, they have to have more stable economic lives. And we see, you know, Hillary Clinton says that she is running for president so that someday a father will be able to say to his daughter, you can do, be anything you want. Having a female president would have that resonance. I feel differently. I feel like the father is going to be able to say that to his daughter when she does not have to, you know, marry someone she maybe doesn’t want to marry so that she can get health insurance, take a job that she doesn’t really want for that reason, where she can have universal childcare, so that she can go to work, and her kids will be well taken care of. All these things which are provided in social democratic countries like Denmark, when those things are provided women are on a much more equal playing field with men. And I think that that really gets left out in all this talk of symbolism and historical this and that. PERIES: And you say Hillary’s record is really faux feminism. What do you mean by that? FEATHERSTONE: Well, faux feminism is a bit of hyperbole, because of course–of course all kinds of revolting ideologies are part of feminism. I can’t say only my feminism is the real feminism. I’m kind of kidding about that, a little. But what I do think is that that sort of feminism is not actually serious about improving the vast majority of women’s lives, that what Hillary represents–what I mean by faux feminism is that it’s elite feminism, so it is only going to serve a few. So you know, elite women who may cheer, you know, the symbolic lifting of the glass ceiling that Hillary represents. But on the other hand what her record represents is, as I say in the piece, a contempt for the kind of social democratic policies that most women need. So she, she advised her husband, Bill Clinton, to go through with what is now known as welfare reform, throwing many, many poor women and their children off the welfare rolls, shredding what little safety net they had in the United States. She has been red-baiting Bernie Sanders, essentially, on the issue of single-payer healthcare, suggesting that single-payer healthcare is going to, you know, destroy our healthcare system, which is obviously nonsense and not borne out by the experiences of countries that do have it. And you know, so she has really demonstrated a great, not just lack of interest, but an active contempt for the things that women really need to make their lives better. PERIES: Now, one could argue that at least as senator or secretary of state, Hillary has made attempts to profile women, give them awards when they’re fighting for women’s rights. She did introduce the Paycheck Fairness Act, and trying to address workplace discrimination, and so on. So what do you make of her track record in this area, and do you argue that her track record hasn’t been in favor of women? FEATHERSTONE: Well, I think that even there it’s been remarkably weak. I mean, there’s Paycheck Fairness Act, which you know, makes it a little easier to sue employers if they’re violating laws we already have on equal pay. Which, you know, of course that’s a good thing. But then again, you know, she, as secretary of state, prevented Haiti from raising the minimum wage for is largely female workforce of garment workers to a lavish $5 an hour. So I think that, you know, her record on these kinds of material issues says more about what she would do for the vast majority of women than these kinds of small bore incremental gestures that she’s made in the Senate. PERIES: So Liza, what do you say to this entire movement of women who are behind her? And particularly young women, who see it like you described earlier, that this could be the first female president we might have in the United States, and should we not get behind her as most African-Americans did around Obama? FEATHERSTONE: You know, I don’t actually think we’re seeing that among young women. The, the polls show a big generation gap with young women not being particularly compelled by Clinton or even by the prospect of, you know, her gender as a reason to vote for her. And older women being, being perhaps somewhat more convinced by that. And we’re not–and I don’t think we’re seeing on the ground anywhere near the kind of passion and excitement to volunteer for her that we’re seeing on the Sanders side, actually. So I’m not sure, really, how much of a movement there is at the grassroots. I see the support for Hillary as, you know, much more elite. We hear a lot about it from the media opinion-makers. We see a lot of people writing columns, a lot of people tweeting. But I don’t really think there is actually that much of a Hillary movement. I could be wrong about that. PERIES: Liza, one final question to you now. When I look at history I see female leaders such as Golda Meir, Margaret Thatcher in the UK, even President Bandaranaike in Sri Lanka who was the first female prime minister in the world, and then I see leaders such as Kirchner in Argentina or Michelle Bachelet in Chile. And these are very different kinds of women. You know, the earlier generation felt they had to be even tougher than their counterparts to be a good, strong leader. And then you have more humane and socially conscious leaders such as Kirchner and Bachelet. Where do you think she would fall on this? FEATHERSTONE: Yeah. You know, it’s really interesting because Hillary Clinton clearly belongs to the earlier generation of female leaders, and actually, Yasmin Nair has a terrific passage in her essay for our collection, where she talks about how Clinton seems to feel compelled to be tougher than a man in all realms, whether it’s foreign policy, criminal justice, resulting in some really brutal policies that she has supported and executed. So that’s–and it is interesting that some of these other, other newer leaders that you mentioned, she recently said she would not govern like a man. But if–I mean, you know, I don’t want to sound too stereotypical here, but her entire record shows almost an overcompensation of, you know, vicious, masculinist, aggressive, punitive, big daddy politics. So I don’t know how we could now, you know, believe her when she, if she’s claiming some softer, kinder–. It kind of reminds me of when Bush ran, promising a kinder, gentler Republicanism. It’s like, yeah, I mean, you have to really go by history and what the record actually shows rather than a campaign promise. PERIES: Liza, I thank you so much for joining us today.